Last month was our annual beach vacation. Typically during the beach vacation I will sign up for pole classes at the local pole studio. This year I wasn't feeling up to taking some pole classes so I opted for some beach yoga and I made use of the island's playground equipment. Upon returning back home to the city, I decided to explore our local park and experiment with the playground equipment for a fun summery work out. Below is an easy routine that can be done in a circuit format- perform each exercise for 10 reps and repeat in 3 rotations. Be sure to bring adequate hydration when doing any type of fitness activities outside. 1. Slide Push Ups: Start by planking the body while gripping the sides of the slide. Keeping elbows close to torso when flexing arms into down position. 2. Stair Stepping: I used the steps as a step box to engage the glutes and quads by stepping in a rhythm with my feet. If you're listening to music you can easily step to the beat to incorporate some cardio into this exercise. 3. Shoulder Shrugs: Great exercise for aerialists by working on the shoulder girdle musculature that is important in both pole and aerial work. Starting from a hang with biceps close to ears, engage the upper back muscles by pulling the scapula down which will pull the biceps away from the ears. 4. Knee Tucks: A staple in pole conditioning. Inside arm grips the pole low and outside arm placed above for a double bent arm grip. Engage the core and arms by pulling the elbows into the torso. You also want to engage the back muscles by pulling the scapula down. I place my hip in front of the pole to support my weight during the lift. Bending knees to chest in the lift then extend legs to hover over the ground. Repeat without touching the ground. Exhale during the working part of the exercise. You will use your breath to pace yourself so you don't rush. You'll also want to repeat the same movement on the opposite side by reversing the side of the pole and arm placement. 5. V-Ups: Using the slide, start by balancing into a V. As you straighten your body, bring your arms overhead. Engage your core to resume the starting position. Make full use of your breath by using the exhalation during the movement of the exercise. Of course no good work out can't go without a little play! I'd love to see your playground fitness posts. 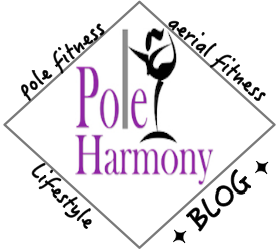 If you've been working out on the playground or drew inspiration from this post, feel free to tag @poleharmony.